What we most and foremost want in our work is to understand how to abide by reality before our own thoughts and prejudices. Therefore, our first step when starting Aventura de Construir was a very extensive field research whose objects were micro entrepreneurs in São Paulo and ATST areas, their professional, individual and familiar needs, and their ambitions, wealth and strengths, usable in achieving their dreams.Many services and supporting institutions were identified and suggested, since most of them were not aware or couldn’t understand how to get benefits from those organizations. We also noticed the existence of professional and human obstacles for a sustainable business, hardly surmountable without a close, competent, systematic and long lasting aid.Without wanting to replicate an already existing institution, Aventura de Construir decided to focus on this type of one by one assistance, as needed for a real and lasting impact, as usually not provided. Once again, the individual counseling does not imply a prior knowledge of the entrepreneur´s needs, as it is based on a close relationship and a careful and ongoing observation of the micro entrepreneur in his own personal history and priorities. Figure 1 helps us to remember what are the key factors to be explained over the time when making future decisions. By the continuous monitoring of the factors of reality, we came to understand how necessary it was to add to our proposal new guidelines to our developing projects, and among them we highlight: management and administration training courses, technical trainings about specific topics and conducted in partnership with specialized institutions (SEBRAE, SENAI and experienced professionals), meetings with successful entrepreneurs, artists’ testimonies and courses with scientists, targeted at arousing the creativity as a key element for development. 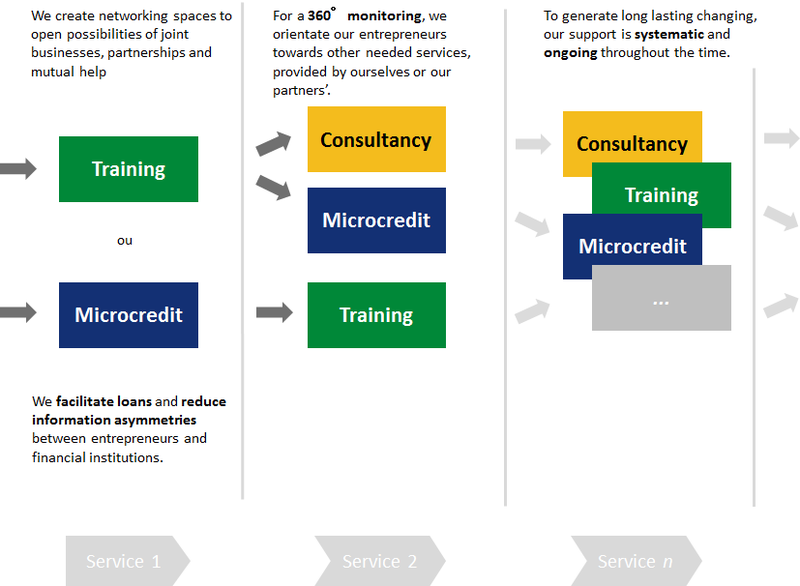 In this direction, the synergy of the supporting activities for entrepreneurs (training, follow ups, micro credit) is an important factor, because whatever it is the channel and the reason for the first contact, the entrepreneur can get involved – according to his requirements and specific characteristics – in all the relevant ones. Empowerment and entrepreneurship: Can we learn from Anitta?